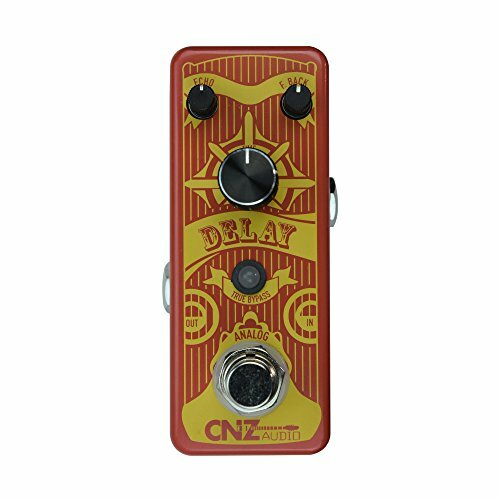 As always, the build quality of the Analog Delay Guitar Effects Pedal from CNZ Audio is great, with metal encompassing the entire pedal, weighted knobs and crisp button pushing. A Classic, Vintage Poster design rounds out the great feel. While it has a solid build, its mini size allows it to be lightweight, easy to travel with, and leaves plenty of room on your pedalboard. The bottom of the pedal has a thick rubber pad to keep it still on any surface. The Vintage Delay tones from this pedal match the classic sounds of great guitarists and will compliment the tone of any other pedal or guitar sound. The delay sounds perfectly embody your guitar tones and other effects on your pedalboard. Create great delay effects as a beginner or advanced player. Match the tempo of the song and place with other pedals for amazing sounds. Inspire Your Music! The Analog Delay Guitar Effects Pedal from CNZ Audio is part of the Vintage Series pedals meant to bring you those classic guitar riffs from yesteryear and let you breathe new inspiration to your music. The Echo knob lets you adjust how long the echo lasts or how many echoes you want to hear. Choose from around 1 to 10 echoes, plenty to fill any needed space in your music. The Feedback knob allows you to control the volume of the feedback from this pedal. Low feedback will provide a clear crisp delay, while adding some feedback will give more body and volume to the delay effect. This added bonus to the pedal gives the opportunity for a dynamic delay effect. The Time knob simply allows you to adjust the speed of the delay. Match the tempo of a song or create your own riffs using specifically timed delay effects. Inspire Your Music with CNZ Audio! If you have any questions about this product by CNZ Audio, contact us by completing and submitting the form below. If you are looking for a specif part number, please include it with your message.